I remember the first time I had potatoes in Mexican cuisine, and it blew my mind. 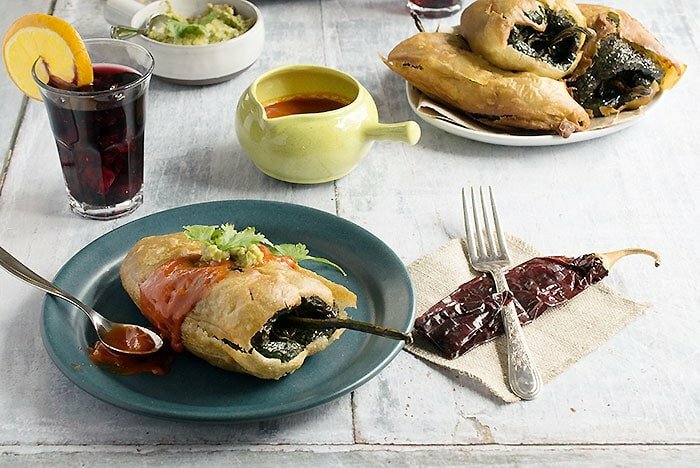 Until you’ve had a mashed potato burrito or this Vegan Potato-Stuffed Chiles Rellenos, you haven’t had the most comforting Mexican food of all. Smashed, Mashed, Boiled, and Baked – and Fried Too! is Raghava Iyer’s newest book. There are 76 recipes that are all potato all the time. Please note that this is not a vegan book, but there are many recipes that are naturally vegan, and most of the others can be easily veganized. This post is sponsored by the wonderful Idaho Potato Commission in conjunction with Workman Publishing. The recipe includes deep-frying instructions. While I indulge in fried foods now and again, I rarely make them at home. The instructions with the recipe made it easy to do. However, if you are on an oil-free diet you can bake or air-fry them. I added more chickpea flour to the batter to make a thicker. It did taste more like chickpea flour than the as-written version, so next time I will add some regular flour instead. I deep-fried two and baked two. I preheated the oven to 375 degrees and placed the battered peppers on parchment paper. I baked for about 20 minutes, but check the color of the coating and see if the top of the pepper is softening to know when it’s done. Making the sauce oil-free is easy, just water saute the onions and add a little extra water to the sauce if needed. 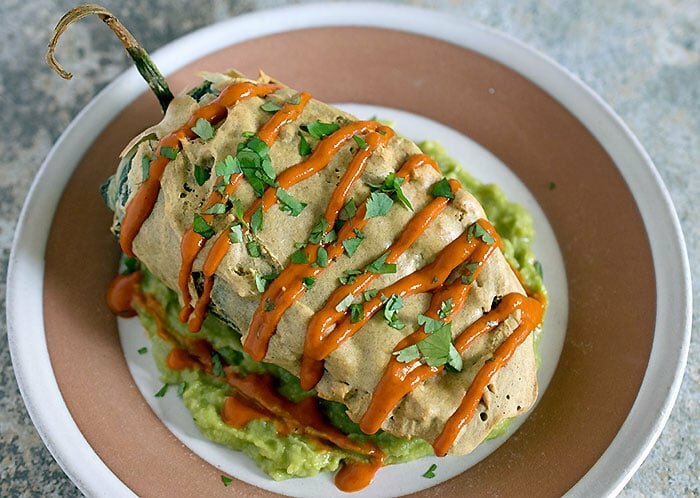 Vegan Potato-Stuffed Chiles Rellenos from Smashed, Mashed, Boiled, and Baked - and Fried Too! The chiles rellenos> in Mexican restaurants often contain plenty of salty cheese filling in roasted poblanos that are dipped in an egg-flour batter and fried. But you can execute a healthier vegan rendition with creamy potatoes and an eggless batter! Peel the potatoes and cut them into quarters. Give them a good rinse under cold running water, place them in a medium-size saucepan, and cover them with cold water. Throw in the garlic cloves. Bring it to a boil over medium-high heat. Turn down the heat to medium-low, cover the pan, and gently boil the potatoes and garlic until the potato pieces fall apart quite easily when pierced with a fork or knife, 15 to 20 minutes. While the potatoes cook, place the guajillo chiles in a medium-size bowl and pour the boiling water over them. They will float at first because they are very light when dry, but as they absorb water and start to soften, they will sink. Allow them to soak for about 15 minutes. Meanwhile, prepare the poblano chiles. Slit each from the stem end down, halfway through its length, without cutting through (make sure to leave the stem intact). You want to create a slit wide enough so you can reach in with your fingers and scoop out as much of the seeds and ribs as possible to fashion a cavity. Once the potatoes are ready, scoop out 1 cup of the potato cooking water and set aside. Drain the potatoes and garlic in a colander and give it a good shake or two to get rid of excess water. Working in batches if necessary, transfer the potatoes and garlic to a ricer and press them through into a medium-size bowl. (If you don’t have a ricer, use a potato masher and fluff them with a fork when completely mashed.) Sprinkle in 2 tablespoons of the oregano, all the cilantro, and 1 teaspoon of the salt, and fold to incorporate them. Remove each guajillo from the soaking liquid (it should be tepid enough to handle the chiles) and yank out the stems. The stems will separate easily along with the ribs and some of the seeds. Discard these. Reserve the soaking liquid. Transfer the guajillos to a blender jar, sprinkle in the remaining 2 tablespoons oregano and the paprika, and pour in ½ cup of the soaking liquid. Set the jar aside. Pour 2 tablespoons of oil into a medium-size skillet and heat it over medium-high heat. Once the oil appears to shimmer, add the onions and stir-fry them until they start to turn light brown around the edges, 3 to 5 minutes. Scrape the onions into the blender jar and add 1 teaspoon of the salt. Pour another ¾ cup of the guajillo soaking liquid into the onion skillet to dislodge any remaining bits. Divide the potato filling into 4 equal portions and stuff 1 portion into each poblano cavity. Combine the chickpea flour and the remaining ½ teaspoon salt in a medium-size bowl. Pour ½ cup of the potato cooking water over the flour and whisk it in, making sure that there are no lumps and that the batter is the consistency of thick pancake batter. If it is too thick, thin it a bit with a few more tablespoons of the reserved liquid. Pour oil to a depth of 2 to 3 inches into a wok, Dutch oven, or medium-size saucepan. Heat the oil over medium heat until a candy or deep-frying thermometer inserted into the oil (without touching the pan bottom) registers 350°F. Line a large plate or a cookie sheet with several layers of paper towels. 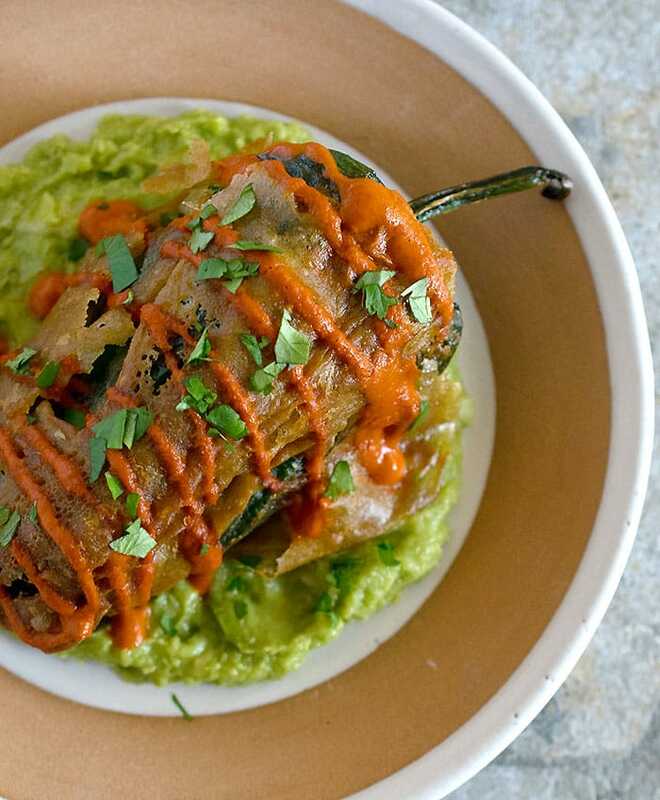 Once the oil is hot, dunk a poblano into the batter, making sure it is completely coated. Gently slide it into the hot oil. Coat and add a second poblano to the oil. Deep-fry the poblanos, periodically turning them with tongs until they are reddish brown and crispy, 5 to 8 minutes. Transfer them from the oil to the paper towels to drain. Repeat with the remaining poblanos and batter. To serve, ladle a few tablespoons of the guajillo sauce on each serving plate. Place a warm poblano on it and ladle a generous cup of the sauce over the top. Serve right away. Here are a few of the recipes I’m going to try from Smashed Mashed Boiled and Baked – and Fried Too! next: Harissa Potato Salad, Nutty Potato Phyllo Triangles, and Tea-infused Potatoes. Tell me what your favorite ways to eat potatoes are in the comments. My husband and I just made this last night and it was great. 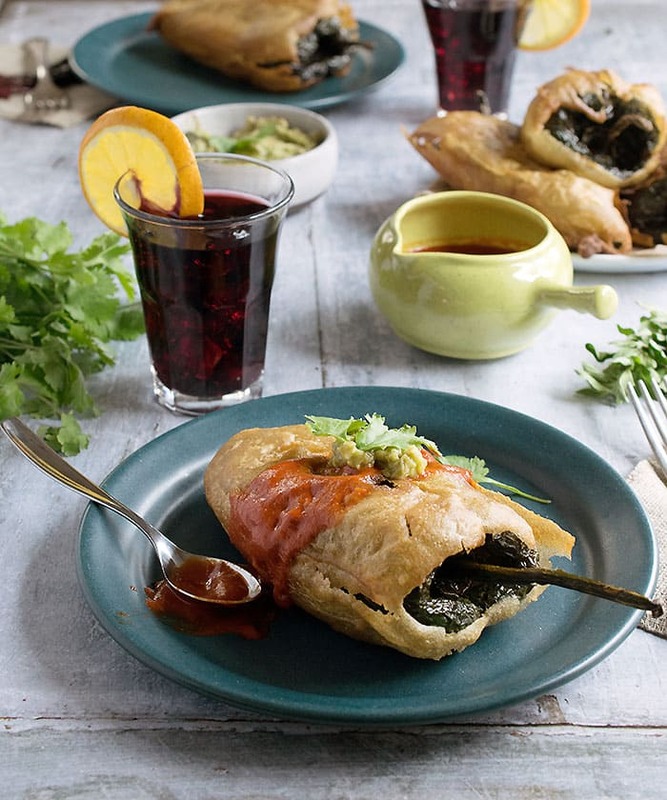 Since I have been eating plant-based we have been missing making Chile Rellenos since we didn’t know how to make them without cheese but these potato-based rellenos are great! Thanks for sharing!